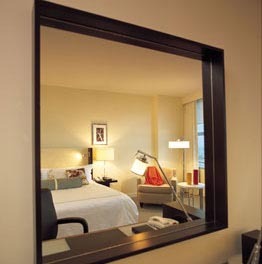 This page allows you to find directions, post a comment, read reviews, and check rates at the Conrad Hotel. Rates: Low season from $169. High season from $399. The Conrad is located in a conclave of glass and steel in the financial district. It is a luxury hotel that combines ultimate service, the latest in technology advancements, and Miami's style. Click HERE for Conrad Lodging Information. • Take 836 East to I-95 South Exit at South 8th Ave..
• Turn Left on 8th Ave.
• Turn Right on Brickell Ave.
• The Clarion Hotel is on the Left side of the street. 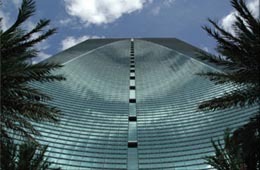 The Conrad is located at 1395 Brickell Ave., Miami , FL 33131. Use our Miami hotel map to find the exact location of the Conrad.